Manta Rays have many many rows of tiny "peg-shapped" teeth that are on the lower jaw only. The teeth are actually used for mating, instead of to help with feeding. Manta Ray are really gigantic filter-feeders that get their nutrition from crustaceans, and other planktonic small fishes. 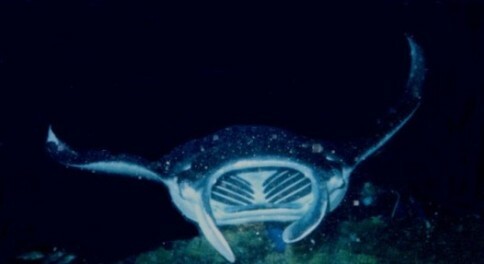 The Manta Ray's body and mouth are quite adapted for feeding. It has two fins, called Cephalic fins, on the front of its mouth. When these fins are positioned just right at an angle, prey are funneled right into their huge mouth. Also, Mantas generally feed at the surface (where plankton and krill are in large numbers). 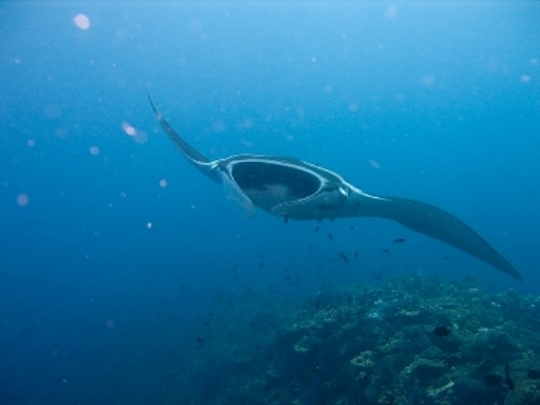 Once Inside the Manta Ray- The ray has spongy tissues that are used as a mechanism for filtering food. These plates are pink/brown, and are located in the gaps between the sequential gill bars. Gill bars are skeletal bones that basically support the gills, made of cartilage. +The rays are most often encountered as solitary individuals, but members of this species often congregate in regions offering predictably rich feeding (such as off hotel coasts at night and off the western Carolinas). +In some of these regions, there are up to 50 individuals clustered in the same general area, but never do they form true schools. +Special areas contain an abundance of plankton and zoo plankton, with nutrient-rich waters. These areas include sub-marine ridges, and many oceanic islands. To find out how Manta Rays make mini-mantas, we can continue on to Reproduction.